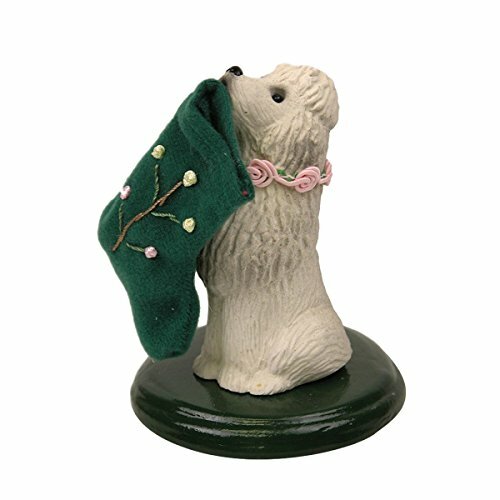 Byers' Choice Poodle Dog is beautifully handcrafted to add a bit of whimsical charms to your home. Each Caroler is crafted in Pennsylvania, starting with the clay faces that are formed and then individually painted by hand. Each outfit is hand sewn, trimmed, and decorated by over 80 artisans, many of whom have been creating Christmas joy for decades. The Byers Choice campus is dedicated to bringing the special warmth and traditions of Christmas into your home. You will love building or giving a collection of Byers Choice fine handcrafted gifts. Byers' Choice Poodle Dog is beautifully handcrafted to add a bit of whimsical charms to your home. Hand-painted with unique and classy design. Wearing a pinkish flowery design necklace with a sophisticated green Christmas Sock bitten by the dog for a perfect holiday touch. This unique Poodle Dog along with the complete collection of Byer's Choice Christmas Dogs makes a great addition to any caroler display! Stands 4' tall. Handmade in the USA. If you have any questions about this product by The Carolers, contact us by completing and submitting the form below. If you are looking for a specif part number, please include it with your message.